At first glance, choosing furniture for your home or office doesn’t necessarily seem like a task that involves environmentalism or recycling. But the truth is, when buying furniture, we can all make an effort toward conscious consumerism by selecting locally crafted unique metal products that last longer and produce less waste during the manufacturing process. At TMRnyc, we’re committed to keeping our carbon footprint as small as possible by reducing manufacturing waste, turning swarf into functional art, and crafting products that last far beyond the lifespan of traditional wood furnishings. “Swarf” is a catchall term used to describe the filings, shavings, and waste left over from the metalworking process. 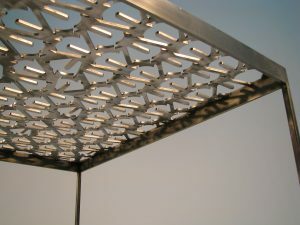 Instead of recycling our swarf the way most fabricators do, we decided to salvage the laser-cut steel sheet drops to create our “greenest” product, the Swarf Table. After our laser cutting, NYC master craftsmen gather the usable swarf to make these individually unique pieces, which are ideal for a broad range of uses: offices, lobbies, homes, and more. That means your Swarf Table is made of upcycled materials; instead of being recycled, they’ve been put to use in new fabrication. New York City’s website for locally manufactured products, madeinnyc.org, has even included our Swarf Table among their green product listings. We’re proud to create lasting, beautiful custom metal furnishings through environmentally conscious processes, and we’re always glad for the opportunity to sell to our local neighbors. Come visit us in Brooklyn, and see how great buying local can be.